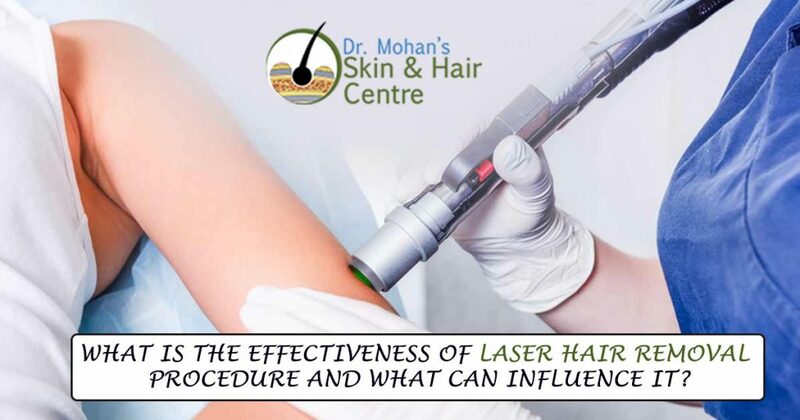 What is the Effectiveness of Laser Hair Removal Procedure and What Can Influence it? Every woman wants the sleek beauty and unblemished skin free from unwanted body hair to get the desired perfect skin women to choose various cosmetic products which can be a temporary solution but for permanent results generally, women choose the laser hair removal procedure. Not only the women but also men choose this procedure to get rid of unwanted body hair for effective and permanent results. The laser of specific wavelength deactivates the hair follicles and stops them to grow again and put them in the resting phase of the hair growth cycle. Thus the patient can get rid of unwanted hair for a lifetime. The effectiveness of this procedure largely depends on the health and extent of hair present on the targeted area. A patient who has a greater amount of hair cannot have the expected results in the single session and even they cannot get 100% removal of hair. Even the patients who are suffering from some disease like PCOS in which body hair grow rapidly such patients cannot get the effective results of the procedure. Thus we can say the effectiveness of the procedure can vary case by case. Another important factor that can influence the effectiveness of the hair removal treatment is the variety and quality of laser equipment used for the surgery. That is why the choice of the best clinic can give you the more effective results. Before and after treatment safety measures can also make the huge difference to the quality of results. If the patient is committed to following complete instructions for prevention and care after the surgery then he can have the effective results.